There are plenty of apartments for rent near Bristol, PA. But we think The Commons at Fallsington stands out. Located moments away in Morrisville, we're a quiet, comfortable place for your family to grow. But we're near major highways, making your commute to Bristol -- or elsewhere -- a breeze. Headed to work at Gamesa? Play at Silver Lake Nature Center or Waterfront Park? Dinner at the King George II Inn? 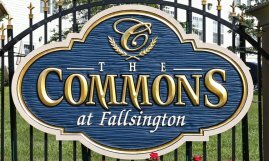 The Commons at Fallsington is a hop, skip, and a jump away. Ask us for more information about our apartments for rent near Bristol, PA. Better yet, come see us at The Commons at Fallsington!